Have you ever seen such a beautiful painting on a piece of silk satin? Just imagine embroidering such a delicate figure with threads and needles! But such exquisite embroidery has been one of China's most famous art forms for many centuries, and four main schools of embroidery have established with their unique techniques. S: Mohammed Babul Hossain wrote us a letter recently. He says in his home country of Bangladesh, women wear long pieces of fine cloth called Saris. M: They are very beautiful. I'd love to try one on. M: Thank you, Stuart. Maybe you should tell us more about the letter. S: Well, Babul wants to know something about traditional Chinese textiles and clothing. It's a rather broad topic. Can we narrow it down? M: How about we talk about Chinese embroidery? We could choose another aspect of textiles and clothing for a future program. S: Good idea. As anyone who has been to a museum and seen the clothing that the emperors and other big wigs used to wear, exquisitely embroidered silk robes and things were all the fashion in the royal court for centuries. M: And the ranks of the officials could be told from the embroidery on their robes. S: So embroidery has been an established art form in China for a long time. And the embroiderers really went to town - not just robes, but shoes, theatrical costumes, table cloths, bed covers, screens, banners, hankies, hats, any bit of silk stretched across a frame, and shoes - nothing was safe from the needles of the practitioners of this ancient art. M: That reminds me. I went traveling to the ancient city of Pingyao last winter. Guess what I found? I saw some very nice embroidered shoe-pads. They are just lovely. I bought a few pairs. S: Shoe pads? What are shoe pads? M: Those things you stick inside your shoes to make them easier on your feet. S: Oh, I think you mean insoles. Shoe-shaped things made of something soft and warm. M: That's what I mean. But I checked in a Chinese-English dictionary, and it said shoe pads. S: Can't believe everything you read in books, Min. But do you have them with you? Are you standing on them? M: No, they're far too nice to squash under my feet. S: A fate worse than death. M: For once I agree with you. No, they are in my folk art collection. S: Framed and hanging on the wall? M: Not a bad idea. They are really lovely. S: I can imagine. I bet they were done by an old lady who kept herself busy embroidering before she was married. M: And probably after she was married. S: Cos women kept themselves out of mischief by embroidering for hours and hours. Right? M: Kind of. But embroidery was never solely a female activity: some men also did it. And we've mentioned that this skill was long seen as very important. In fact, an emperor of the Song Dynasty established an embroidery bureau in the 12th century. S: But it goes way back further in time. Historical records tell us that embroidery appeared in China some 4,000 years ago. Well before television. Amazing! No wonder it's so well developed, and embroidery became widespread in China during the Han Dynasty, some 2,200 years ago. By the way, the Silk Road came into being during the Han Dynasty, too. M: Talking about embroidery becoming widespread. I've traveled to many places in China. And I always keep a look out for local embroideries, especially those from a few decades ago, before machines took over. S: Like your fancy insoles. M: You've got it. But I must mention that the most famous four schools, or types of embroidery, are those of Suzhou, Hunan, Sichuan and Guangdong. S: I've seen embroidered pictures from Suzhou. They're set in a frame, and the two sides of the embroidery are the same. 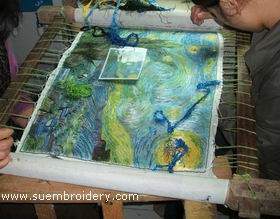 Very skilled work, no ugly knots and things on the back, and usually done, by hand of course, using very fine silk thread. It would take me a week to thread the needle. And most of the pictures are of cats. The fur looks quite real, you can see the individual hairs. And the eyes look at you. M: I know what you mean. In fact, Suzhou embroidery is famed for being fine, smooth, dense and even. And guess how many colors are typically used just for the eyes of these cat pieces. S: I'll have to guess. Five hundred and thirty three. M: Don't be silly. Twenty or more colors usually go into the cats' eyes. But there's more than pictures of cats. S: You're right. Several years ago I saw an embroidered picture, about 90cm by 1.2 m big - a winter scene at the Summer Palace, pristine white snow, red berries, frozen water, it was beautiful, but very expensive - ten or 15 thousand RMB, something like that. M: Not surprising, it must have taken months to make. S: And come to think of it, I don't know if it was Suzhou style. Never mind. Not important. Talking about Suzhou embroidery, it's been popular there for over 2,000 years. Located in the lower Yangtze River valley not far from Shanghai, Suzhou was described as "every family raising silk worms and every household embroidering." M: Yes, in the old days girls made embroidered incense bags for their lovers as tokens of their amour. S: And they often embroidered a pair of mandarin ducks, which are symbols of loving couples. Why, I wonder? Do mandarin ducks mate for life? Have to check it out. M: I don't know. But in addition to ducks, other birds, and flowers, fish, and animals were the most common subjects for embroidery. My parents used to have a pair of pillow covers with double ducks on. I guess they got them when they married. S: Moving on. We've established that Suzhou embroidery is famous for its extremely delicate stitches, and cats and ducks. What about the other three types of embroidery? As far as I know, Hunan embroidery adopted some strong points from Suzhou and Guangdong embroideries in forming its own style. Is that right? M: That's right. Hunan embroidery is famous for its rich colors. The unique technique of Hunan embroidery allows threads of different colors to mix naturally, producing a very harmonious effect. This technique is best shown in embroidering lions and tigers. The shades and luster of the fur of these big cats look best in Hunan embroidery. S: That's funny. The double-faced cat is typical of Suzhou embroidery. Now, it's cats again, big cats, in Hunan embroidery. But Hunan embroidery also borrows elements from traditional Chinese landscape painting, and landscapes are popular favorite subject of this embroidery style. M: Stuart, the other two schools of embroidery, Sichuan and Guangdong, share something in common. Know what it is? S: Min, as usual, you're thinking of food. Right? The cuisines of Sichuan and Guangdong, or Cantonese, are perhaps the most famous of China's food styles. Their embroidery is not so well known, but equally tasty to the embroidery gourmet. M: Sichuan embroiderers are very fussy: they will only use locally made cloth and thread, and their patterns are chosen mainly from local folk art. So Sichuan embroidery has a strong local flavor. S: Like the food! Everything is related! Cantonese embroidery, by contrast, tends to have rather complicated patterns. "All birds paying homage to the phoenix" is one favorite subject. Very colorful, and lots of colors. M: You're right, it can be quite dazzling. And did you know that thread made from peacock feathers is sometimes used in Cantonese embroidery? S: That's new to me. M: And Cantonese embroidery is famous for its three-dimensional effect, as well as bright colors. They make really good decorations. S: Have you got any? M: Not yet, but I will, in time. S: Talking about time, it is flying. Time to move on. But before we do, a quick review: Suzhou embroidery, lots of two-faced cats. Oops, didn't express that well. I mean two sided cats. M: Hunan embroidery: Lions and tigers with lovely fur. S: Sichuan embroidery: strong flavor of local folk art. M: And Guangdong embroidery: complex and colorful. S: Babul Hossain, and all you other people out there, we hope you found our brief intro to Chinese embroidery interesting.